I was busy in my MBA studies because of which I skipped watching many movies resulting to which even my mother had to stay without watching a single movie. The new PVR Cinemas inauguration happened in Panvel during this time itself and the ladies of my colony decided to watch a movie there. 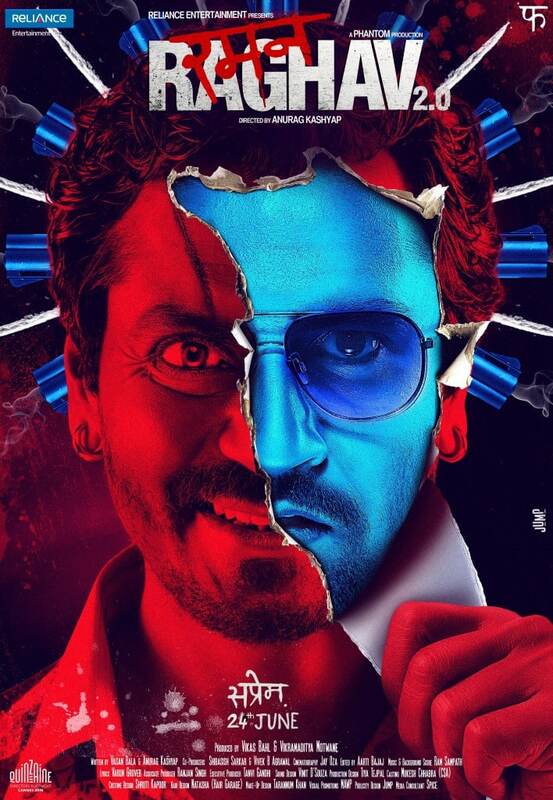 They didn't know much about Raman Raghav 2.0's genre and hence they booked the ticket of it. After watching the movie when my mother came back home, she felt depressed for next one week and kept telling me that she have never seen such a horrific movie ever in life and wishes to never see such movie again. This made me more curious about what is so evil in this Anurag Kashyap's movie. Finally, I watched it this Sunday and may be because I'm more evil and wicked, I didn't go through the same despair which the aunties of my society did. Haha! But the movie is definitely different from what we regularly see in the Bollywood. Yes, the basis of it is the same- that the killings done by criminal and police is one and the same thing but just that they are two different side of a coin. This results in the introdution of two characters- Raman- the criminal who is psychotic and kills people like a mad man without feeling any sort of attachment or sympathy. The only problem is that in the whole movie, we are not made to understand what made him so wild and crazy that he went on killing people so badly. On the other hand, Raghav is the policeman who is investigating these murders. He has a backdrop which we get to know in a scene when he is with his father. Also, his girlfriend blames him of killing her 3 babies as she has to go under abortion each time. This leads him to become what almost Raman himself is- A Killer. The movie cannot be called as thriller as there's nothing for which a suspense is kept. It is just a series of chapter and back to back murders or interrogations. Nothing else. Problem is that whenever director comes close to letting us know about what made these personalities so evil, he goes back to the black screen where another murder is about to happen. But still Nawazuddin Siddiqui's perfect and flawless acting does it all for Kashyap. Similarly, Vicky Kaushal have also done a great job and you'll not forget him after coming out of the movie which is an achievement in itself as matching up with Siddiqui is almost impossible for a newcomer. I give this movie 2.5 stars out of 5.